Sure, large blenders are awesome if you are having people over for a party. However, big blenders take up a ton of space and they can be every expensive too. Maybe you just need a small blender for quick personal use, such as for smoothie making. If that is the case, you might want to take a closer look at the Bella Personal Size Rocket Blender. As expected from a basic small blender, it has only one setting. It is very easy to use, even with dry ingredients. Very basic and a number of complaints from users. Overall a well priced small blender for single smoothies and for pulverizing dry ingredients! The Bella Personal Size Rocket Blender is ideal for anybody who needs a quick and easily manageable blender. No, it is not very big, so it is not ideal for making very large quantities of smoothies at once, such as for a party. However, it is the perfect size to make 1 or 2 single-serving smoothies to take with you, have for breakfast, or even for a quick protein powder shake after working out. As the name implies, this is a personal-size blender. With that being said, if you need to make smoothies fast, or if you need to pulverize dry ingredients into a powder, the Bella Personal Size Rocket Blender is an excellent choice to stick with no doubt. When you buy the Bella Personal Size Rocket Blender, you get the 240-watt base, along with the power cord. You also get 2 large blending cups for making smoothies, ones that attach directly to the blade for convenience, plus both cups also come with easy-sip lids, which means that you can leave the smoothies in the cups and take them with you on the go. You also get a smaller cup, one that is ideal for powdering spices and nuts. Keep in mind that the blade for making smoothies and the blade for dry foods are two different blades, each ideal for their specific jobs. With the dry foods cup, you also get lids ideal for shaking out the powders evenly, much like a salt or pepper shaker. If you need a good blender, a small one, the Bella Personal Size Rocket Blender definitely has a lot of cool features that you will like. First of all, it is very small and compact. It can easily fit on any countertop and it can easily be stored in any small kitchen cupboard. It barely takes up any space at all. Yes, this does mean that its capacity is a bit limited, but this is a personal single-use blender for quick smoothies, protein shakes, and more. The Bella Personal Size Rocket Blender features a 240-watt motor, which is admittedly not all that big or powerful. However, the cups are not that big and the blades are more than sharp enough to make up for the lack of motor power. In all reality, this particular blender can handle pretty much any kind of food out there. Now, it might not the best item to blend up ice cubes and solid frozen fruit, but other than that, it can handle pretty much anything, even hot liquids. What is nice is that you do get 2 large and 1 small cup. All of the cups attach directly to the blades, which means that you can just pop the cups right onto the blender, blend away, remove the cup, and then drink the smoothie right from the cup. The large cups are ideal for smoothies, and the small cup is ideal for dry foods. Yes, the Bella Personal Size Rocket Blender can be used to pulverize spices, nuts, and other dry foods into fine powders. This blender is very easy to use. Simply hit the button and watch as food turns into powder or smoothies. 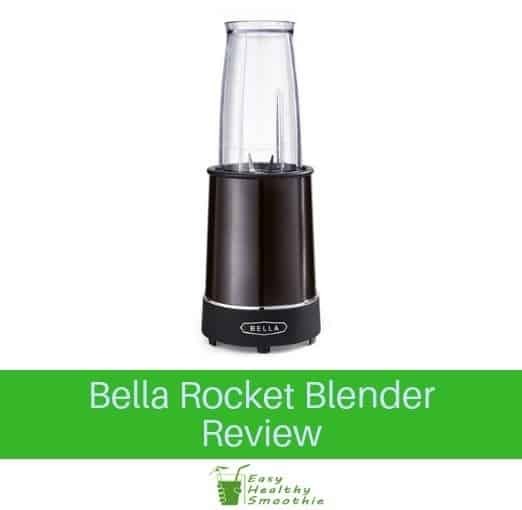 At the end of it all, if you need a nice little blender for single-serving smoothies, or just to pulverize some dry ingredients, the Bella Personal Size Rocket Blender is a great option to go with. It may not be very large, but it does pack a bunch and it definitely works well.